C: Greg Smith (208-91) of Houston R.
Halcones Rojos celebrated third straight road victory against Toros to grab back the LNPB title, which they last time won in 2010. Visitors cruised past Toros last night 69-92 ending the finals series with almost perfect 1-4. Toros were the LNBP champions last season. The guests trailed by 2 points after first quarter, but they stormed back to get the 11-point lead at the halftime and later won the game 69-92. Halcones Rojos dominated down low during the game scoring 50 of their points in the paint compared to Toros' 30. They looked well-organized offensively handing out 21 assists. Venezuelan power forward Luis Bethelmy (200-F/C-86) orchestrated the victory with a double-double by scoring 23 points and 11 rebounds. Venezuelan point guard Gregory Vargas (182-PG-86) contributed with 14 points and 7 assists for the winners. Five Halcones Rojos players scored in double figures. Halcones Rojos' coach Eddie Casiano felt very confident that he used entire bench. American-Nigerian forward Ike Ofoegbu (205-F-85, agency: Paris Global Sports, college: SMU) answered with a double-double by scoring 23 points and 10 rebounds (was perfect 11-for-11 from the free throw line !!!) and Dominican power forward Elys Manuel Guzman (206-F/C-82, college: Bemidji St.) added 10 points and 10 rebounds (was perfect 8-for-8 from the free throw line) in the effort for Toros. 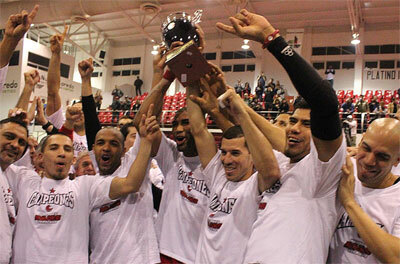 Halcones Rojos were the regular season champions in LNBP with 34-6 record. They swept Barreteros and Pioneros in the Quarterfinals and Semis with perfect 4-0. LNBP All-Star Game was played last night. Mexicans were better than Foreigners in a high-scoring meeting 142-136. The fans had opportunity to enjoy and to watch the best LNBP players at the one place. Jesus Lopez (205-F-83, college: SW Baptist) stepped up for Mexicans with double-double of 26 points and 11 rebounds. Paul Stoll (178-G-85) also was great adding 23 points and 11 assists, while Michael Mitchell added 20 pts and 7 rebounds. In defeat, LeRoy Hickerson (196-G-82, college: Cumberlands) was amazing with 34 points and 6 rebs. Luis Bethelmy (200-F/C-86) had 24 pts and 6 rebs, and Rene Rougeau (198-G/F-86, college: UNLV) added 19 pts, 5 rebs and 6 as. Mexicans exploded after the breather to create a bigger lead. Foreigners threatened in the finish, but Jesus Lopez and his teammates managed to keep their advantage until the end. Quarters: 37-38, 37-36, 44-27, 24-35.